Eurobus is an annual project that consists of a two-week dynamic bus journey to Ukrainian rural areas with an international crew of young leaders from the EU member-states (8 persons) and Ukraine (4 persons). At the moment the organizers are missing one participant from EU, and that is the reason they are announcing this blitz call. 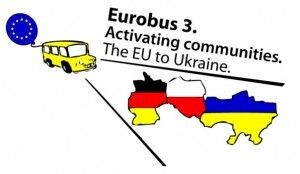 The project will start on May 11 in Warsaw with an ice-breaking session, continue with Schuman parade on May 12, 2012 and an intoroductory training in Lviv on May 13. The journey across Ukraine will last May 13-26. – realize little projects initiated by local youth. To develop intercultural dialogue and foster international cooperation through mentoring. Costs: The project will provide you both with accommodation (mostly in host Ukrainian families, partly in hostels) and food. Also, Eurobus will reimburse a minor part of your travel costs from the home-place to Warsaw and back (approximately 100 EUR). Have experience in youth work: leadership, facilitating, volunteering, training in any projects; Want to share your knowledge and experience with Ukrainian youth; Aware of creative approaches to problem-solving, or use these methods in your work; Like challenging and inspiring journeys; Have spare time from May, 11 to May, 27 2012 to spend in Poland and Ukraine; Aged 18 – 35 years old; A citizen of the EU. Speaking Ukrainian or Russian as well as NGO membership is an advantage. To apply, please fill in the application form until 5th May 2012 avaible here: http://eurobus.org.ua/wp-content/uploads/2012/03/EU_application-form.doc and send it to info@eurobus.org.ua.